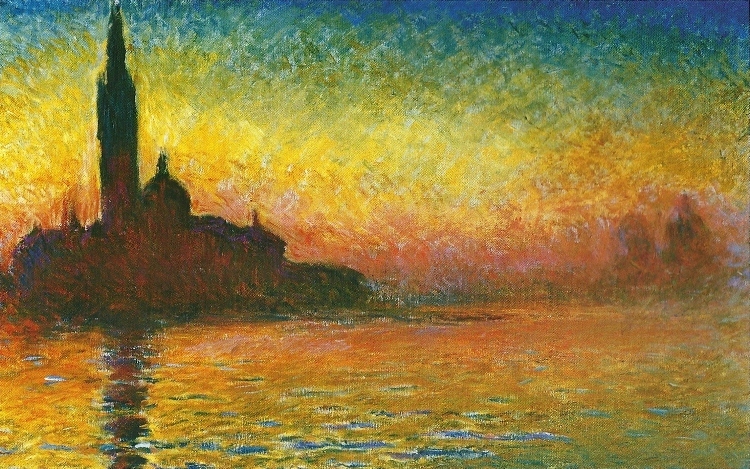 Claude Monet painted View of San Giorgio Maggiore, Venice by Twilight, in 1908. Monet traveled throughout his life, painting in The Netherlands, England, and all over France. In 1908, he left his home in Giverny and spent three months in Venice where he painted the sea, canals, and buildings on 37 canvases. It was during that trip that Monet painted his view of the island San Giorgio Maggiore and its church. Upon arriving in Venice, he wrote “"Although I am enthusiastic about Venice, and though I've started a few canvases, I'm afraid I will only bring back beginnings that will be nothing else but souvenirs for me." Even though he was painting, it was a trip to spend time with his wife, Alice, and their friends in Italy. By this time, Monet was 68, and soon he would develop cataracts. The room the couple stayed in had electric lights, and Alice wrote home about how wonderful it was that Monet could see his paintings. Soon after, they would have electricity installed at their home in Giverny. In View of San Giorgio Maggiore, Venice by Twilight, Monet paints the island from across the harbor. On this trip, Monet and his wife fell in love with the Mediterranean sunsets. The painting has a warm sky, starting blue at the top, working its way from orange, to yellow, to a deep red. The colorful sky is reflected in the water below dancing in the shallow waves of the sea. The church and its bell tower are shown silhouetted in dark blues and violets highlighted in dark reds as the water shines light back into the churches shadows. At this point in his career, he was still painting outdoors but often from a porch or looking through an open window - as was the case in the Rouen Cathedral and Parliament series. Many of the paintings from Venice were started in this same manner and then finished in his studio in Giverny. View of San Giorgio was started in 1908, the date on the painting, but not finished until 1912. Like many of his series paintings, View of San Giorgio is about light. The difference between the goal of those paintings, the Parliament Series, Haystacks, Rouen Cathedral, and View of San Giorgio lies within the trip itself. While those previous paintings were studies with the goal of exploring light, his paintings in Venice were, as he said, souvenirs. Or, at least, paintings both celebrating the colors displayed in Italian light and reminders of a magical city. Paintings like View of San Giorgio are interesting in that they show the subject, the island and its church, but they also show the path towards abstraction.